Cnaeus Domitius M.f. M.n. Calvinus was a Roman general, senator and consul (both in 53 BC and 40 BC) who was a loyal partisan of Caesar and Octavianus. 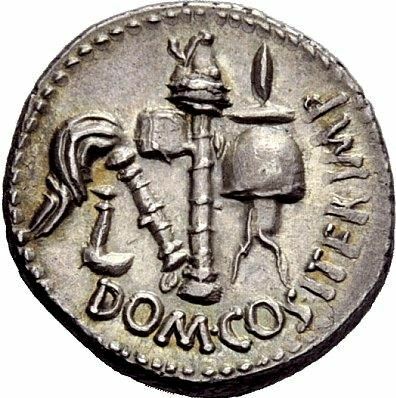 He struck coins as Imperator in 39 BC. Domitius Calvinus's activities after the death of Caesar are unknown, but in 43 BC he was a strong supporter of Octavianus and participated in the civil war against Brutus and Cassius. During the Philippi campaign in 42 BC, he had to bring reinforcements from Italia to Greece for Mark Antony and Octavianus' army, however his fleet was destroyed by the enemy in the Ionian Sea with the loss of two legions. Although Domitius Calvinus' career does not show any particular ability, either in politics (he obtained his first consulship only after scandalous bribery) or in war (he suffered two major defeats), he maintained an important political role. This was most probably because he was one of the very few Roman nobles to support the Caesar/Octavianus party from the very beginning.